U.S. agencies that fund animal testing include the FDA. Government funded animal testing spends billions of dollars every year and kills millions of animals in an essentially unregulated industry. Hundreds of institutions and thousands of individuals profit off vivisection. Furthermore, the government pays for the same experiments to be done over and over. In the fiscal year ending in 2005, seven government agencies funded over 28,937 projects for experiments on 27 species, including: monkeys, dogs, cats and rodents. These included: 1200 separate projects (at up to $495,600,000) examining drug addiction. 778 projects studying "neural information processing" in 11 species racked up approximately $321,314,000. No experiment, however ridiculous, useless or painful; is illegal. The majority of animals used in experimentation receive absolutely no protection under current laws. Government funded animal testing costs U.S. taxpayers over $12 billion annually. See also U.S. Government's War on Animals, section 5. The FDA requires massive amounts of animal testing for the marketing of industrial chemicals, vaccines, and drugs. The FDA is responsible for ensuring the safety, effectiveness, and quality of pharmaceuticals, biologicals, and medical devices intended for human use. Also the safety, efficacy and quality of pharmaceuticals for animals, food, cosmetics and radiation emitting products. Thousands of rats, mice, rabbits, dogs, and primates are killed in "pre-clinical" tests to for new drugs (including all ingredients and even minor differences in formulas). Following an extensive battery of animal testing, drugs generally undergo three phases of clinical trials. The fact that months or years of human studies are also required suggests health authorities do not trust the results. In 2004, the FDA reported that 92 out of every 100 drugs that successfully pass animal trials, subsequently fail human trials. ,  See also animal testing, section 3 on product testing. The FDA finally banned the practice of feeding cow meat and bone meal back to cows in 1997 (after the Mad cow disease epidemic in Great Britain). However, dried poultry waste and sewage sludge are routinely fed to cattle. Pigs and chickens are still routinely fed the bones, brains, meat scraps, feathers, and feces of their own species. Furthermore, tens of millions of shelter animals are also picked up by rendering plants. Thus commercial meat, dairy, and egg products often come from animals whose diet included the ground up remains of cats and dogs, including the euthanasia drugs injected into their bodies. 40 billion pounds a year of slaughterhouse wastes (blood, bone, viscera) and euthanized cats and dogs from veterinarians and animal shelters, are rendered annually into livestock feed. Moreover, the FDA has been using inaccurate, incomplete, and unreliable data to track and oversee feed ban compliance. ,  See also USDA. The need for such for an increase in milk production has been questioned since the dairy industry has been overproducing for 60 years. 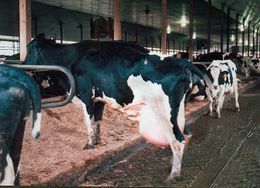 Between 1986 and 1987, under the Dairy Termination Program, dairy farmers were paid over 1.3 billion dollars to slaughter their cows. 144 dairy producers received over one million apiece to refrain from dairy farming for five years and one California producer received 20 million dollars. However, according to the General Accounting Office (GAO), "Total milk production did not decrease because nonparticipating farmers increased their production". Additionally, cows injected with rBGH also have a 25% increase in udder infections and a 50% increase in lameness. In August 2008, Monsanto sold their Posilac division to Eli Lilly. See also meat & dairy industry, section 4. Lester Crawford was the acting commissioner credited with the biggest boom in soy history. During the Crawford/ Jane Henney 1999 tenure, the FDA approved heart health claims for soy and soya foods. (Genetically modified soy is labeled soya in the EU). From 2001 to 2004, U.S. food manufacturers introduced over 1,600 new foods with soy as an ingredient, averaging 400 new products per year. According to the Mintel’s Global New Products Database, there were 460 new products in 2001, 321 in 2002, 386 in 2003 and 443 in 2004. Between 1992 and 2003, soy food sales had a 15% annual growth rate, increasing from $300 million to $3.9 billion over 11 years. As new categories have been introduced, soy has been repositioned in the market place. New customers select soy for both health and philosophical reasons. Jane Henney served as Commissioner of the FDA from December 1998 until the newly-inaugurated President George W. Bush asked for her resignation in January 2001. Dr. Henney was the Director of the CIGNA Corporation between 2004 and 2007. She has also been Director of AmerisourceBergen and AstraZeneca, PLC. Dr. Henney was the VP of Health Affairs at the University of Cincinnati Medical Center and a Sr. Scholar at the Association of Academic Health Centers, until 2003. The chief position at the FDA remained vacant until the confirmation of Mark McClellan in November 2002. McClellan left the FDA in March 2004 to head the Centers for Medicare and Medicaid Services. President Bush then appointed FDA acting commissioner and longtime deputy commissioner Lester Crawford in February of 2005. He was confirmed in July of 2005. After Dr. Crawford's abrubt resignation on September 26, 2005; Andrew von Eschenbach was appointed as acting commissioner. von Eschenbach was nominated in March 2006 and confirmed as the FDA Commissioner in December 2006. In June of 2009, Dr. Joshua M. Sharfstein was appointed by President Obama as FDA Commissioner. He had served as the Acting Commissioner between March and May of 2009. Margaret Hamburg, MD became the 21st Commissioner on May 18, 2009. On May 1, 2007, Dr. David W.K. Acheson, a former University of Maryland Medical School professor and previously the chief medical officer in charge of FDA food safety; was appointed to a newly created position of "Food Safety Czar" by President Bush. Dr. Acheson was directed "to develop a plan for addressing shortcomings exposed by recent scares in the human food supply." "Industry coalition draft of legislative authority for a regulatory agency" whose language was "included in the final bill." Leading a "coalition" of universities, research institutions, pharmaceutical and biotechnology companies to lobby Congress against "costly and ineffective rule making." Leading a "broad industry coalition" to stop several "negative amendments to agriculture/FDA appropriations bills". Worked with legislators in supporting and drafting the "Best Pharmaceuticals for Children Act." Achieved FDA support for a product that had originally been voted down. Interceded on behalf of a client when the FDA final approval. ..Our client's product was approved in a timely manner. Successfully lobbied Congress to secure a 20 million dollar, four year pilot program for our client's product. Secured a 10% increase in funding and "administrative flexibility" to ensure our agency approval of our client's products. Secured language in pending legislation that assured our client's would benefit from government-funded alternative fuels. Secured funds for nutrition and medical research programs. Creating a coalition of six leading biotechnology firms to promote advantageous legislation and meeting with agency officials to prevent "onerous rule making." ↑ Clients, Policy Directions Inc.
Gardiner Harris, "At F.D.A., Strong Drug Ties and Less Monitoring", New York Times, December 6, 2004. Marc Kaufman, "FDA Rethinks Women's Chief. Toigo Is Acting Head; Agency Denies Naming Veterinary Official", Washington Post, September 20, 2005. Laura Donnelly, "FDA Shenanigans," Tom Paine.Common Sense, September 20, 2005. Nico Pitney, "Google Cache Thwarts Bush Spin Machine," Think Progress, September 20, 2005. Avram Goldstein, "FDA Stent Experts Have Financial Ties to J&J, Boston Scientific", Bloomberg, December 4, 2006. "FDA Expected to Rule on Cloned Food This Week", ABC News, December 27, 2006. Marcia Angell, "Taking back the FDA", Boston Globe, February 26, 2007. "New produce-safety rules called 'unenforceable: FDA issues totally voluntary guidelines to avert food poisoning", Associated Press (MSNBC), March 12, 2007. Julie M. Donohue, Ph.D., Marisa Cevasco, B.A., Meredith B. Rosenthal, Ph.D. "A Decade of Direct-to-Consumer Advertising of Prescription Drugs," New England Journal of Medicine, Volume 357:673-681, Number 7, August 16, 2007. Makers of US feed fail to heed rules on mad cow disease, FDA warns livestock feed makers, Madcow.org, accessed Sept 2009. This page was last edited on 13 March 2015, at 16:46.